Alligator cracking can occur on an asphalt pavement driveway if there is a failure in the sub-base under the asphalt surface. We recently received a question from a customer in regards to repairing alligator cracking and I thought it would be beneficial to share the answer with other home or business owners who may encounter the same problem. Q: Would alligator crack asphalt repair be a good ‘do-it-yourself’ project? A customer could certainly purchase our cold mix asphalt and fill in the alligator cracks themselves, however, I don’t think it is a good idea. Cold mix asphalt is a temporary patching material used to shore up a pothole or cavity in a paved surface until a permanent hot mix asphalt patch can be performed. It is not meant as a permanent repair material. Q: So, would cold patch filling be the best fix for alligator cracking? What would you suggest? No. 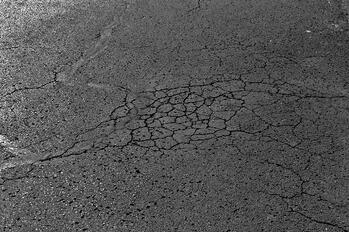 Alligator cracking in asphalt pavement is a sign of a failure under the asphalt surface. Filling in the alligator cracks with a patching product only offers a temporary repair solution. Any area with alligator cracks should be sawcut and removed and the base should be inspected and corrected depending on what is found. Covering an alligator-cracked area with cold mix or hot mix asphalt is a very temporary repair. I often tell customers that it isn’t money well spent. Q: What potential problems could arise if you just patch over alligator cracks? The problem with filling alligator crack areas with patch is that the alligator area is moving as a result of a sub-base problem. In fact, this area is moving more than what the inherent flexibility of asphalt can even cope with. Placing a patching material over the cracks or in between cracked areas will not last. As the asphalt moves, it will ‘shed’ the patch, meaning it will just push the patch out of the cracks and back to the surface. It is okay to do crackfilling and sealcoating temporarily to halt further damage, if necessary, but I would not recommend patch as a long-term repair solution. Q: Should professional’s complete alligator crack repair or can it be a DIY project? It would be best to let a reputable paving contractor handle the repair. We’ll inspect your asphalt surface and find the cause of the alligator crack problem. We will then present you with options that work within your budget. Our goal is to give you the longest-lasting repair to fit your budget. Do you have a question for Wolf Paving on asphalt repair? Let us know in the comments or send us a message.